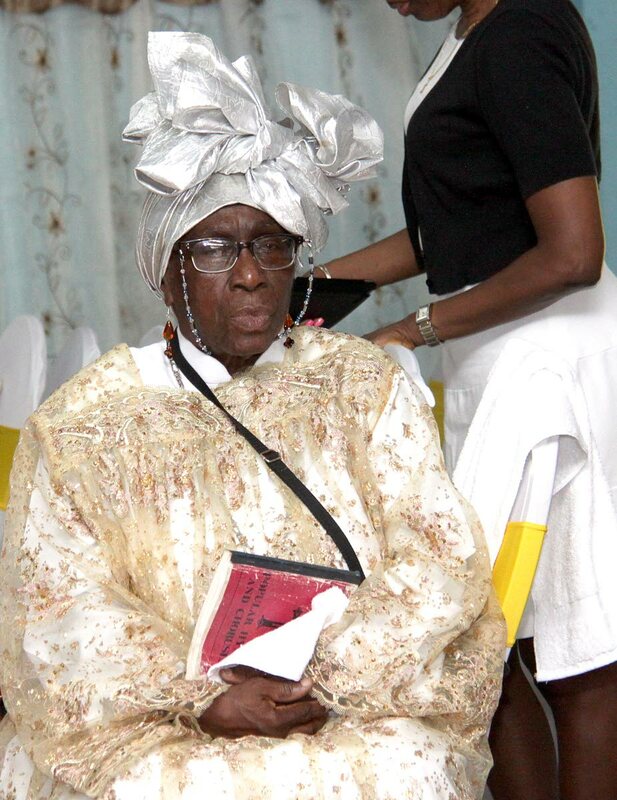 Baptist elder: Episkopus Archbishop Barbara Gray-Burke at Spiritual Shouter Baptist Liberation Day celebrations in Maloney yesterday. 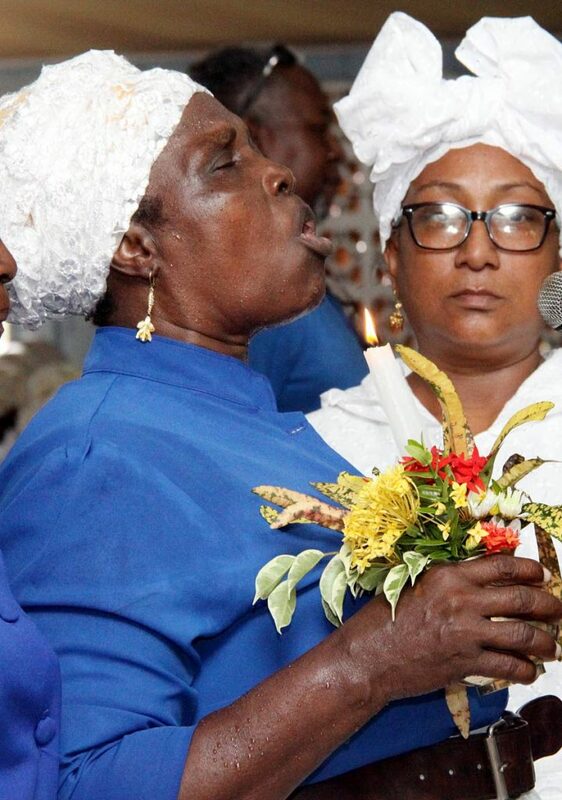 Head of the Council of Elders Shouter Baptists of Trinidad and Tobago Episkopus Archbishop Barbara Gray-Burke yesterday claimed the People’s National Movement (PNM) government has not given her organisation “one red cent” to celebrate Spiritual Shouter Baptist Liberation Day. Addressing worshippers during observances at the Maloney Empowerment Hall, Maloney, Gray-Burke said despite the absence of a state subvention, Shouter Baptists still were able to gather and celebrate the national holiday even though this year’s event had to be scaled down. “The government always gives us funding for our national holiday. Would you believe this year?... I want to talk it openly. They did not give us not a red cent. Gray-Burke’s claim came three days after Attorney General Faris Al-Rawi announced in the House of Representatives that some ten Baptist groups were to receive $120,000 for holiday celebrations. He made the announcement on behalf of Culture Minister Dr Nyan Gadsby-Dolly whilst responding to a question on the issue. Gray-Burke’s group, the Council of Elders, was listed among the organisations to receive $40,000. To compound matters, the outspoken Baptist leader said stipulations imposed by the Public Transport Service Corporation (PTSC) had forced them to cut back significantly on the number of buses they usually hire to shuttle devotees to the Empowerment Hall. 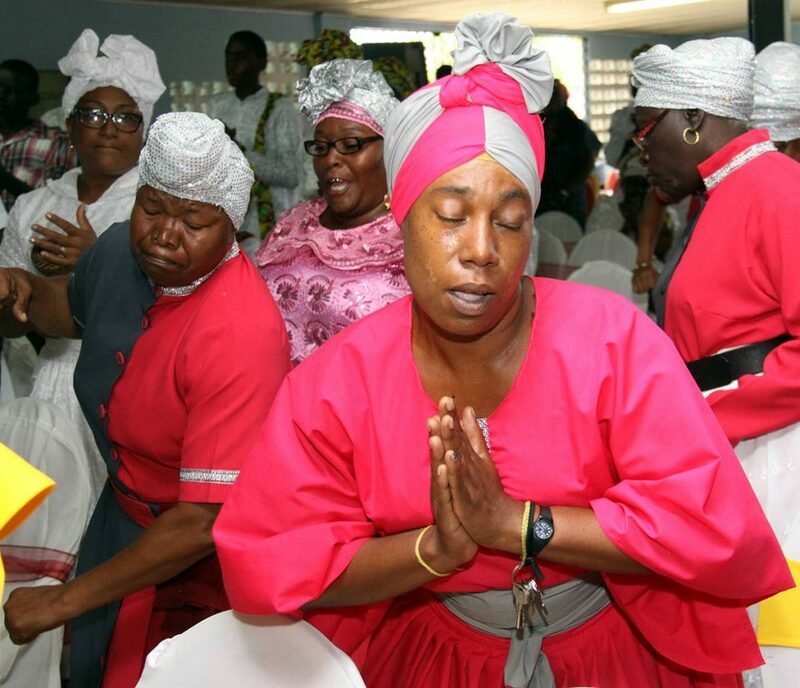 In deep prayer: Worshippers dance and pray during the Council of Elders of Shouter Baptists of Trinidad and Tobago's Liberation Day celebrations at Maloney Empowerment Hall, Churchill Roosevelt Highway, Maloney yesterday. Gray Burke said: “Our standard has dropped because they could not take the number of buses. When you rent the buses, you have to pay a deposit. Is not as if we rent the bus today and we send it back, that Monday or Tuesday they would give us our money back, you know. Gray-Burke declared nothing will prevent Baptists from carrying out their agenda. In her address, Gray Burke, who is also president of the Inter-Religious Organisation, told celebrants education was the key to their continued success as Baptists. She said: “We charting our way on education. We don’t want no cathedral. We have this here (Empowerment Hall). This is our cathedral. I could put some columns if all yuh want a cathedral. I could put one on the highway. Gray-Burke’s position contradicted that of Agriculture Minister Clarence Rambharat and Government Senator Foster Cummings, both of whom called for a cathedral to be built for Baptists. Cummings also called for a parcel of land to bury members of the faith. Rambharat also said the issue must be addressed urgently. Gray-Burke revealed that many Baptists had criticised her decision to accept a senatorial position during the Basdeo Panday administration– one which allowed her to push for a national holiday for Baptists in 1996. “I want you all to know that politics runs our lives, whether we live, whether we die, whether we eat.” Singling out the contribution of women in the faith, Gray-Burke said elevating women to high-ranking positions was never an issue for shouters. Gray-Burke extended kudos to head of the Network of Non-governmental Organisations Hazel Brown, who shared the platform with Baptist leaders. Saying that she and Brown had worked together to help victims of domestic abuse over the years. Gray-Burke claimed that talk of the presence of battered shelters was just that–talk. “They tell you that they have places for battered women and place for this. We could tell them they lie.” Gray-Burke feared there would be an irreplaceable void in the system if and when people like Brown and others decide to call it a day. Looking ahead, Gray-Burke said a secondary school was still on the faith’s front burner. She said she was also involved with succession planning and hopes to consecrate another Archbishop by the end of May. Reply to "Not one red cent!"